Keyboard shown in stowed position, tucked tightly inside cabinet. 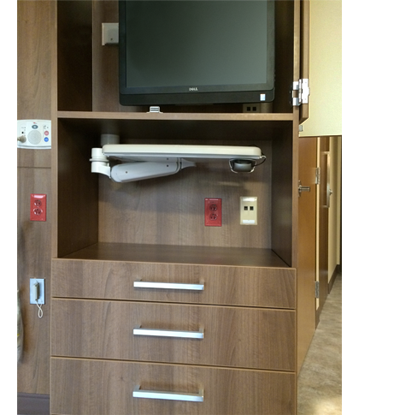 Centura Health St. Anthony North Labor & Delivery, Recovery and Procedure Unit required the installation of a monitor and keyboard into a small cabinet that shared space with a Philips fetal monitor. The monitor’s mounting arm needed vertical movement, horizontal reach and ability to share space with a Philips fetal monitor. For the keyboard, very small cabinet dimensions required a compact mounting arm that could stow completely inside the cabinet yet reach beyond the cabinet face. The high location of the mounting shelf required an arm that could adjust downward to provide proper ergonomics for the keyboard. After defining the objectives, a customized solution was created using ICW’s modular components. Inverted Ultra 180 arms and 6” Ultra AS1 extension arms were an excellent choice for this complex situation. These components provided a compact solution with the essential horizontal and vertical adjustability. The Inverted Ultra 180 arm with two 6” Ultra AS1 extension arms allowed the monitor to be pulled out when needed, raised, lowered and rotated as desired then stowed compactly inside the cabinet. To save space, the monitor arm shared a track mount with the Philips monitor. The Inverted Ultra 180 arm with one 6” Ultra AS1 extension was mounted at the rear of the cabinet under the shelf. The 6” Ultra AS1 extension arm provided reach and horizontal rotation. The Inverted Ultra 180 segment of the arm provided additional horizontal rotation and as well as 16” of vertical adjustment, creating the desired ergonomics for users of the keyboard tray. When not in use, the arm and keyboard tray stowed completely inside the cabinet. The large 24” AiO Monitor/PC fit perfectly into the narrow 27” cabinet. After installation, both the LCD arm and keyboard arm automatically centered within the space. This configuration made use of all the available interior cabinet space and met the exacting requirements of the customer.